Sofie, Pastor Donna’s bumbling Bernese Mountain dog, sits on top of the hill, taking in the view of the accidental country pastor’s someday farm. Morning had broken. I threw on my Mucks and barn coat and, with a steaming mug of coffee in hand, went out into the crisp air to start the day with my version of a breakfast for champions—a hearty prayer walk. Who needs Wheaties when God can nourish you? The sun was breaking through the fog hanging low in the valley and the wind was shooing away the last remaining clouds trying their best to conceal the Green Mountains of Vermont. I let out a sigh of contentment. This scene always brought joy to my heart, taking me back to a long-ago visit to my father’s homeland of Switzerland. It was there a young girl with golden pigtails held her dad’s hand as they walked the hills blanketed with so many wildflowers that not a patch of green grass could be seen. It was there a young girl would sense already in her life the awe of God’s hand at work in nature, watching as the billowy clouds wrapped around the mountains that seemed to embrace the quintessential Swiss homestead with mystery and grandeur. My breakfast of champions—my prayer walk—came to a stop as I noticed I was not alone. The shadow of that young girl with the golden pigtails was walking with me. I stopped and stared and heard my father’s voice as clear as if he was now standing right beside me. That’s what he said so long ago to that young girl with big dreams, big hopes, big prayers. Some how. Some way. Someday…. For some where along the way, without even realizing it, God had been answering me. I was now standing smack in the middle of my someday farm. Sure, to others all they would see were acres of nothing. But my eyes, finally opened to what was possible in the midst of impossibilities, saw it. I could see the barns that yet stood. The coop yet built. The pond yet to be dug out of the forever wet and marshy piece of land that was such an eyesore to me. I could see the fruit trees not yet planted. The garden not yet tilled. They were all there. I finally saw a young girl’s dreams, hopes, prayers, being answered. How many times, though, had I walked this walk and never once realized my some days were always right there waiting for me to act on? I reached my hand towards my shadowy companion, hoping in some miraculous way I could touch not only the hand of that young girl I once knew, but reconnect with her awe in God who embraces us always with his mystery and grandeur. Perhaps if I could hold that young girl’s hand, the one with the golden pig tails, grown up fear and skepticism would give way to childlike trust and faith. I reached but couldn’t grab. The past is elusive. So instead I reached my hand towards heaven to grab hold of the beautiful here and now God was revealing. What are the someday prayers and the someday dreams you’ve prayed and dreamt? Could they perhaps be right in front you waiting for you to finally see? It was an idea discussed only in hushed whispers for many years. Students with farming backgrounds would come to the hallowed halls of seminary and make an important connection between farming and theology, and they would ask the question. 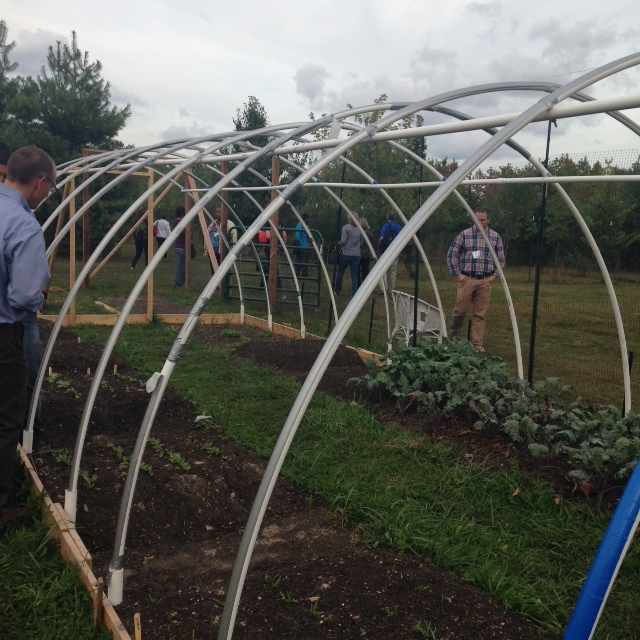 What if theological education could be combined with farming? What if seminary could be a farminary? Farminary, an outdoor classroom where everything Jesus spoke of—the seeds, the weeds, the wheat, the grain that must die in order to produce life—became more than just words on a page, but became powerful, tactile lessons of God’s love for all of creation. Students with farming in their blood would come to the hallowed halls of seminary—and they would go, leaving behind the ghosts of conversations hoping to be resurrected one day. The day of resurrection has come. I stood on the soil of the soon-to-be-full-fledged hoop house on what it is now Princeton Theological’s Farminary, and smiled. For as I looked at the last of the peppers, the late in the season green beans and the strips of land being primed with compost in anticipation of the next growing season, it all made sense to me for it is in a garden, working the soil, planting a seed, dealing with grubs that stole my crops one year (a row of beets, broccoli and acorn squash), that I have felt so close to God. For the garden has been the place for me where life’s challenges, life’s failures, life’s defeats mingled with those seemingly fleeting moments of miracles, hope and, surprisingly at times, abundant blessings. It is in the garden where I have felt it the most. I have felt God’s hand on my shoulder. It is while tilling the soil and being part of God’s creation where I have learned to trust God’s provision—even when the harvest flops. Now I am no farmer. I am a North Jersey girl who only knows how suburban sprawl grows. I have the reputation of being able to kill even the easiest plant to grow. I am a North Jersey girl who shocked her colleagues when I said “yes” to serving a church in rural Upstate New York right on the border of Vermont all because I felt so strongly that there were lessons of life and faith waiting for me there. And there were many lessons of life and faith that I will forever treasure. Friends who know me well look quizzically at me when I talk passionately about the lessons we can learn from farming and my desire to do so. “Um, Donna, you know you can’t take your cute Kate Spade handbags out into the fields with you?” asked one friend who seemed as equally perplexed as she was concerned. The emerging hoop house where the first classes at Princeton’s Farminary were held this past spring. For now, I am excited to see my alma mater has come on board with what those who have grown up on a farm know or those like me, who have served a farming community, know. There is much to learn about God while getting your hands dirty and while breaking your back tilling the ground. There is much to learn about God when witnessing firsthand the seasons of death and rebirth. There is a consoling hug to be felt when seeing your plants fall victim to an early frost. God knows and God cares. There is a gentle hand to wipe the tears of frustration when deer trample your corn. God knows and God cares. There is the resolve not to give up being strengthened when sharing these challenges and defeats in community with others. God knows and God cares. What makes all of this so worthwhile? The feast that always comes—be it in times of plenty or times of want. For it is a feast of miracles and blessings from the soil to be shared with one another, brought forth and harvested through hard labor and trusting hearts. It is a feast spread before us that teaches us the most precious of all lessons. God cares for us deeply and so we, too, must care deeply and tend lovingly to the soil, to the seeds, to the worms, to the water, to one another. Here’s more of the Farminary story!